After a critically acclaimed run at the Royal Court which ends on October 10th, Martin McDonagh’s new play Hangmen is transferring to the West End this winter. The production is due to play a limited run at Wyndham’s Theatre from December 1st. McDonagh is a prolific playwright and screenwriter, his most well-known plays including The Beauty Queen of Leenane, The Cripple of Inishmaan and The Pillowman, for which he received an Olivier Award for Best New Play. The Lieutenant of Inishmore also received an Olivier Award for Best New Comedy. He is also an experienced film director, with some of his most notable work including BAFTA award-winning In Bruges and Seven Psychopaths. 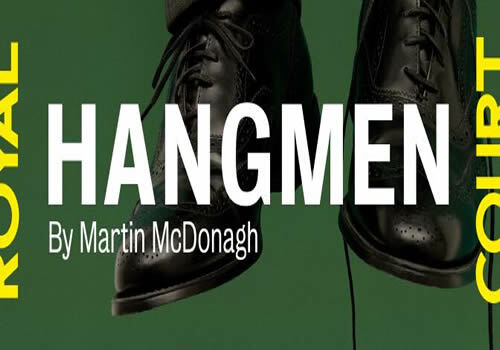 Hangmen is McDonagh’s first play to be staged for more than a decade. Described as a black comedy, Hangmen follows the story of the second-best hangman, Harry, on the day that hanging is abolished in 1964. Whilst reporters and regulars of his pub in Oldham gather around to hear his reaction, a sinister stranger lurks in the shadows with an altogether different motive to his visit. Directed by Matthew Dunster, the production features Design by Anna Fleischle, Lighting by Joshua Carr and Sound by Ian Dickinson. Original cast members David Morrissey (Harry) and Johnny Flynn will reprise their roles for the Wyndham’s transfer. Hangmen will open at Wyndham’s Theatre following a current run of The Father, another West End transfer. It will run from December 1st until March 5th 2016. Contains moderate language and themes and is not ideally suited to young children.